The Force awakens - here and now! Entertainment Earth's first-ever 3 3/4-inch scale exclusive Star Wars vehicle! Plus an exclusive First Order Stormtrooper Officer 3 3/4-inch action figure! Figure includes a blaster and a red pauldron. Entertainment Earth Exclusive! 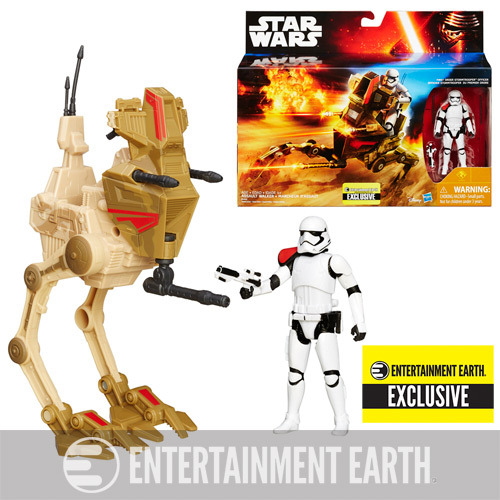 Crush the resistance in the desert with the Star Wars: The Force Awakens Desert Assault Walker with First Order Stormtrooper Officer - Entertainment Earth Exclusive! This fantastic boxed set brings you a 3 3/4-inch scale action figure and a vehicle. Your army won't be complete until you add this awesome armored officer and his ride to your squadron! Ages 4 and up. The 7-inch tall Desert Assault Walker features an articulated chin gun, jointed hips, and moving ankles so you can pose it in a variety of fun and menacing ways. The brown vehicle sports red highlights and a unique deco you won't find anywhere else! The 3 3/4-inch First Order Stormtrooper Officer is designed to stand perfectly atop his mighty mechanical monster. He boasts fully articulated shoulders, hips, and neck. His blaster is painted with black details and is specially designed to plug right in to his thigh, rather than deal with bulky and antiquated holsters.